VERNON — Everybody knows the saying “Money can’t buy you happiness” but Roberto Zaccardelli knows firsthand just how on point that saying is. Zaccardelli, who grew up in East Hartford, graduated from Harvard Law School in 1990. Upon graduation he got a job at a high-pow- ered corporate law firm in New York City, working alongside some of the best lawyers in the country in a 60-story skyscraper near Rockefeller Center. He lived in Soho, made big bucks, and was on track for a celebrated legal career — but he wasn’t happy. He found that what he worked on at the firm was tremendously tedious and, in the grand scheme of things, seemingly meaningless. And in return the firm demanded it be No. 1 in his life. It all came to a head one day when one of the firm’s partners gathered the first-year lawyers together to introduce them to his life’s work — a shelf full of recently leather-bound books of legal papers and documents. And with that Zaccardelli quit the firm after less than a year, moved back to Connecticut to work in his family’s restaurant business, and never looked back. As he told that story recently to a reporter Zaccardelli was sitting in a booth at the restaurant he’s been helping manage for his father almost since that day he left New York — the eatery now known as Elmo’s Dockside, at 48 Hartford Turnpike in Vernon. And he had a big smile on his face, knowing that 18 years after leaving the firm, he made the right decision. There are things more important than money, things that all the money in the world can’t buy — love, spending time with his wife of 17 years, Lisa, and their two daughters, Giuliana, 16, and Alessandra, 14, forging close relationships with his staff and customers, doing what he enjoys and having purpose in life, and making Elmo’s Dockside into one of the best seafood restaurants in Tolland County. Zaccardelli, now 44 and residing with his family in Bolton, has lived a truer, richer life since returning to the family restaurant busi- ness that he grew up around — and being able to make the relationships in his life, from his family to his customers, his life’s work. The site of Elmo’s Dockside has been a restaurant owned by Roberto’s father, Elmo Zaccardelli, since 1969, when the elder Zaccardelli opened an Italian eatery known as Casa Nova there with a business partner, Santo Benacquista. 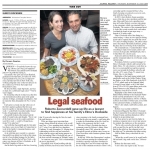 In the late 1980s after Benacquista’s nephew, Victor, had been running the restaurant and decided to open his own place elsewhere in town, taking the Casa Nova name with him, the site of the restaurant reverted to Elmo’s sole ownership and he renamed it Elmo’s Sea Catch, focusing on seafood so as not to complete with the Casa Nova. 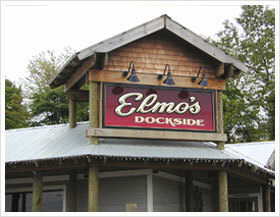 In 2003, when Roberto began assuming more of the day-to-day operations and his parents, Elmo and Clara, were spending more time in Florida, Roberto oversaw renovations to the restaurant, which was renamed Elmo’s Dockside. The exterior of the restaurant literally looks like a rustic seaside dock, and makes you think the beach is just steps away — instead of 50 miles south. Elmo’s Dockside offers fine dining in a casual setting — there are two spacious dining rooms and a separate bar area with flat screen TVs and a working fireplace. The entire restau- rant is decorated with nautical artifacts, giving the place the feel of being on the waterfront. The restaurant has a “scratch kitchen” where everything is made from scratch, and it’s all overseen by head chef Ali Kharboush, who’s worked there for a dozen years. Seafood is delivered fresh six days a week, and the restaurant makes its own breads, soups, and dressings. Nowadays, Roberto is general manager of Elmo’s Dockside, which is still owned by his father, Elmo, 76, who returns to work there as the ever so personable host and door-greeter every year around the holidays when he and his wife of 51 years, Clara, 73, return from Venice, Fla., to visit family. Highlights of the lunch menu include deli sandwiches such as the Grilled Turkey Wrap, the Ruben, or the Club Sandwich, from $6.95 to $7.95; salads such as the Spinach Salad, Crowned Caesar Salad, or the Cobb Salad, from $7.95 to $10.95; pasta dishes such as the Pasta Primavera or the Mussels & Pasta Fradiavolo, from $9.95 to $10.95. Highlights of the dinner menu include Baked Stuffed Shrimp or the Dockside Platter (fried seafood assortment) for $21.95 each, Poached or Grilled Salmon, $18.95, or Maine Lobsters from Elmo’s lobster tank, served with lemon and drawn butter, at market price. There’s also salads, sandwiches, pastas, and burgers. 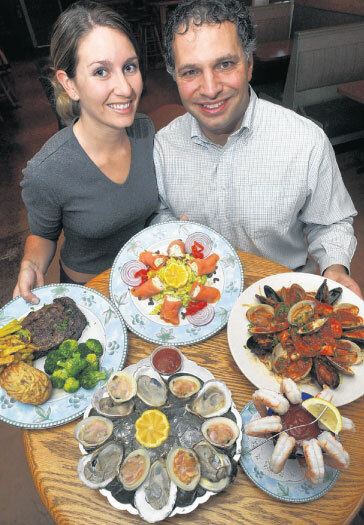 Roberto was recently notified by Connecticut Magazine that Elmo’s Dockside has been named the best seafood restaurant in Tolland County, and that distinction will be printed in an upcoming issue. The best advice he got from his father in running a restaurant was to never take anyone for granted, the employees or the customers. “You’re only as good as the people who work with you and for you, and if you don’t treat them in the right way, the restaurant won’t run the right way,” he remembers his father saying. And his father always cherished the customers. “When they would come in, he would smile. He had such a big smile on his face,” Roberto says. Roberto has that same smile. “I don’t have any regrets at all,” he says.